White Knight PHC40 고압력 정량펌프는 40 bar (580 psi) 의 유체 토출 압력을 제공. 최대 7 Bar (100 psi) 의 공압을 공급 가능. 분당 60 ml 까지 토출. 금속 없는 흐름 경로로 이온화 오염을 방지. PHC40 high-pressure pump overlaps pressures between two chambers to eliminate pressure spikes and provide continuous flow. 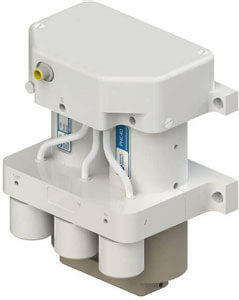 An on-board controller operates air pressure through four internal solenoid valves. The valves route the air to refill each piston and dispense at the appropriate time. The pump multiplies the supplied air pressure by six times to obtain the high-pressure fluid output. An external digital signal is used to turn the pump on/off, and digital outputs are transmitted to enable users to monitor operations.